Wallpapers are available in many different materials, textures, colors, patterns, and prints. Just like when you select rugs or wall color, the size of the room will be a large factor in determining which wallpaper is right for your space. If you are slightly hesitant, you can start in a small area, like a powder room or closet, and see if you are ready to take the plunge in other rooms. If you are fearless, a large scale print can be used in larger rooms to keep proportions in check. There are many ways to get creative with your wallpaper installation to create visual interest. 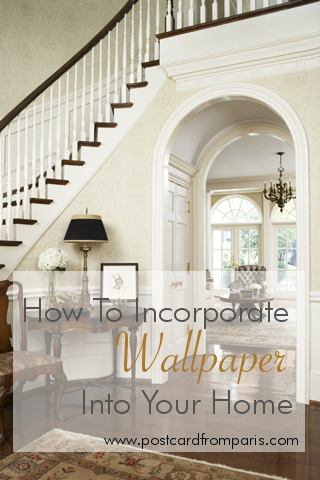 Below are a variety of spots to consider when deciding where to add a touch of wallpaper. 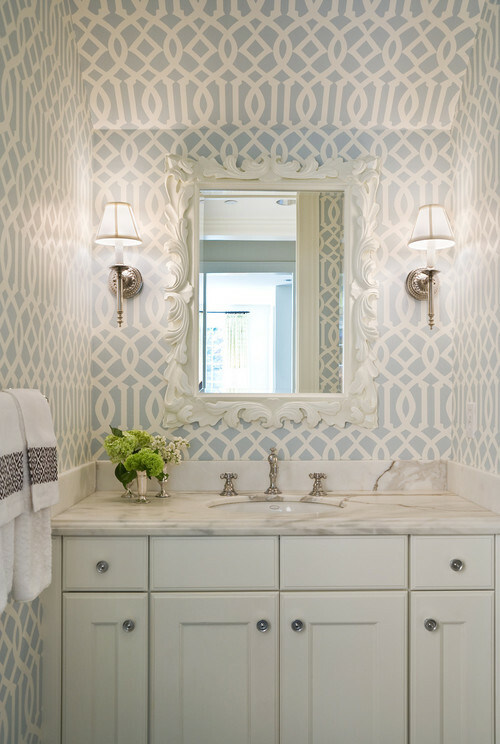 The Powder Room: Powder rooms are a room that most of your guests will visit at some point. These small spaces are great opportunities to add some wow factor without having to commit to a large amount of material or labor costs. 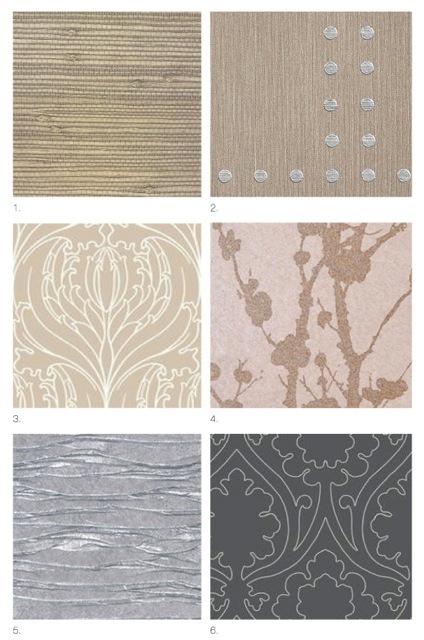 Some of our favorite papers to use in powder rooms are soft metallics or tone-on-tone patterns so your eyes aren't overwhelmed in a small area. An Accent Wall: If you desire some dramatic wallpaper in your great room but don't have an ovious place to begin and end the paper because of an open floor plan, you can achieve a lot of the look with just an accent wall. First, you select the wall you'd like to highlight , like one with a fireplace or nook. Next you either select a paper whose background is the same as the paint currently on the room's walls. Or, if you have a paper you are dying to use but it doesn't blend with the room's current paint, you can repaint the room with the background color of your desired paper. This careful coordination of the paint and the paper will highlight the wall you would like but will also provide a seamless transition from paper to paint in your great room. On the Ceiling: Wallpaper doesn't have to stay on the walls. Ceilings are often overlooked when it comes to wallpaper, but they can be a great place to add some unexpected interest. If you have high ceilings that you want to warm up, you could go with something more patterned or colorful to make the space seem less tall. If you have lower ceilings, we would recommend using a metallic or neutral that will reflect light, making the ceiling appear taller. Back of Shelving: If you have a lot of built-ins in your home and are looking for a way to spice them up, papering the backs of the shelves can add instant visual interest. This also cuts back on the amount of effort you need to put into your shelving accessories because your shelves will already speak for themselves. Since these are generally small areas, you can have fun with unusual colors and patterns. Bedroom: Bedrooms are great places to add wallpaper because they have a clear definition of space, allowing you to terminate the paper easily. 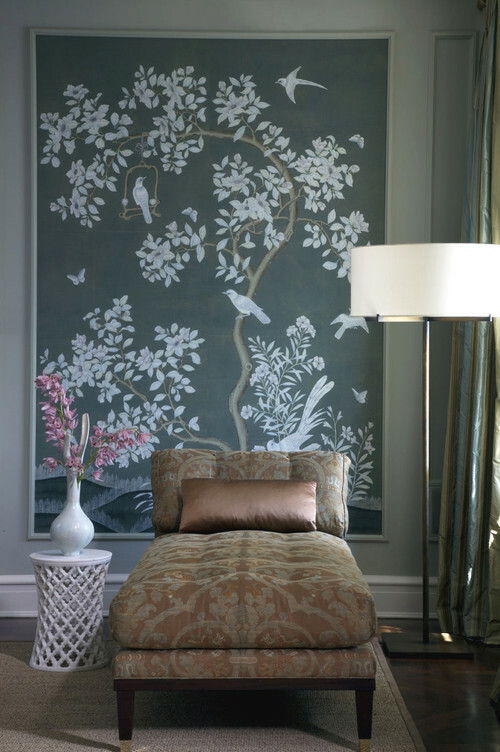 It is best to go with something neutral and soothing in a master or guest bedroom so that you feel calm upon entering. If you are papering a child's room, we'd recommend having a little more fun with color, texture, and pattern. Framed Panels: If papering your entire bedroom or living room seems like too much, you can always frame large panels of paper as "artwork". You can do this in a wood or glass frame or even with architectural moulding. The latter is a very traditional look while the former is a more contemporary spin on a classic. These framed panels can be done in dining rooms, foyers, stairwells, bedrooms, etc. The sky is the limit! To get an idea of some of the patterns and textures that could change your space, explore the six styles one of our designers has gathered below. 1. This simple grasscloth is neutral and timeless, making it the perfect wallpaper for those wanting to add dimension and texture to their walls. 2. This riveted paper is masculine, but the metallic elements give it some feminine detail. This would look incredible in a powder room, study, or theater room. 3. This tulip damask pattern is gorgeous! It's tone-on-tone color is very subtle, allowing this paper to work in a multitude of settings. This pattern is one that will stand the test of time and will never look dated. 4. This pattern is actually formed from tiny glass beads giving a simple pattern a layer of complexity. This would be beautiful in a powder room or on the back of book shelves. 5. This metallic wave pattern would add dimension to walls, ceilings, shelves, or a frame. This is a more contemporary spin on the grasscloth, but this will look great in your home for years to come as well. 6. This paper is a more transitional approach to the damask. It is simple yet graphic and I would love to see this on a ceiling, in a powder room, or large framed panels flanking a bed. How do you feel about wallpaper? Tell us in the comments below. For more on adding texture to your walls, check out our tips for paint finishes by clicking the button below.